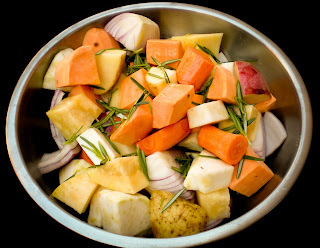 Fruits are out of season, now it is the time to enjoy our seasonable root vegetables. During fall, we can easily stock up our pantry with a bag of potatoes, carrots, onions and yams. I also went to farmer's market to pick up some additional root vegetables that I never tried before. Celeriac (celery root) and rutabaga are the ones that I picked up. When I'm confronted to a foreign ingredient, I tend to look up in my mini food encyclopedia on how to choose the best and fresh ones. The encyclopedia also explains how to prepare the ingredient, where it is best use for, as well as the way to preserve it. 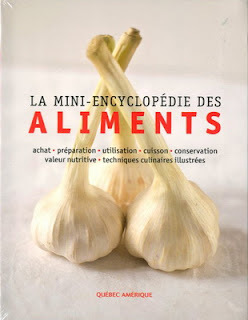 Unfortunately, this book is only available in French as I am aware of. I'm pretty sure we all love roasted vegetables, who doesn't? The idea of roasting vegetables might not seem obvious to everyone the first time, even for me. Once you read about it, all you really need is a bit of oil to coat the vegetables, sprinkle it with some spices and herbs to add a new dimension of flavours or to keep simple, simply season with salt and pepper. For this recipe, the quantity does not matter, use whatever you have available in your fridge. 2. Cut all vegetables into 1-inch pieces. Place celeriac pieces into a bowl of water with lemon juice, immediately after cutting to prevent from browning. 3. Combine all vegetables and rosemary leaves in a large bowl. Drizzle enough olive oil and toss vegetables to coat. 4. 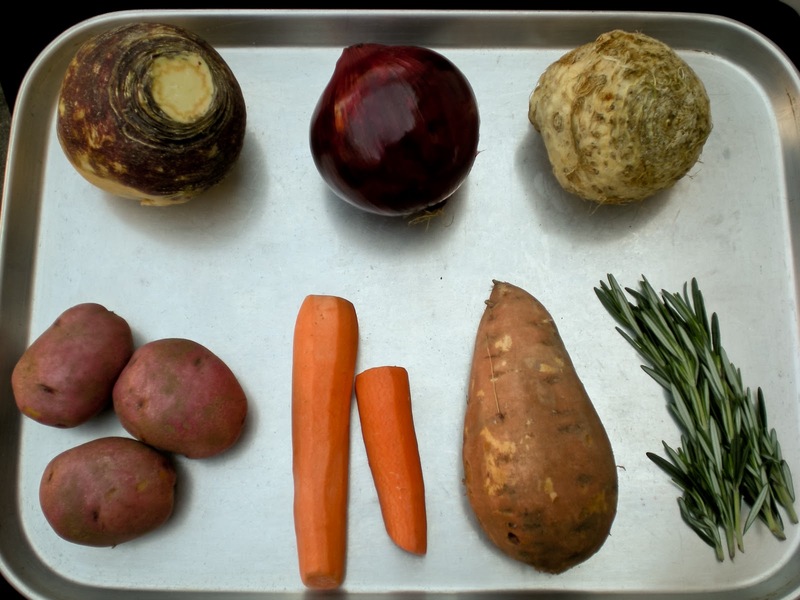 Transfer vegetables to a baking pan. If two baking pans are necessary, place one rack in the center of oven and one in the bottom third. Roast for 30 mins, stirring and turning occasionally. 5. Reverse the positions of baking sheets. Season generously with salt and pepper. Add garlic cloves. Continue roasting for 45 mins until tender, stirring and turning occasionally. Love any dish with lots of vegetables.. thanks for the roasted vegetables idea! how are you? never heard of rutabagas but i love roasted veggies. I can easily clean up the whole plate for you!! 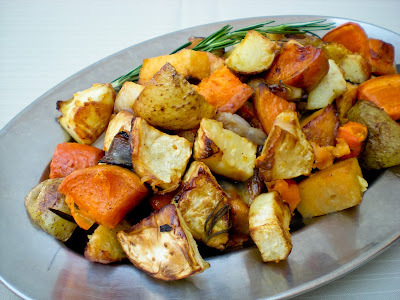 I love roasting vegetables in the fall.Good way to eat root vegetables. Thanks for the blog comment. Love this roasted veggies, best way to sneak the root vegetables..
Wow I feel like a kid back in my mom's kitchen. I grew up on this stuff. Pics are really great! I'm pretty sure you would lick everything that I make. Thanks for caring. I'm recovering slowly, not easy to work with the illness. I wish that I grew up with this dish, it is so good that I would make it all the time. I love roasted vegetables! Roasting brings out the best flavor out of the veggies! 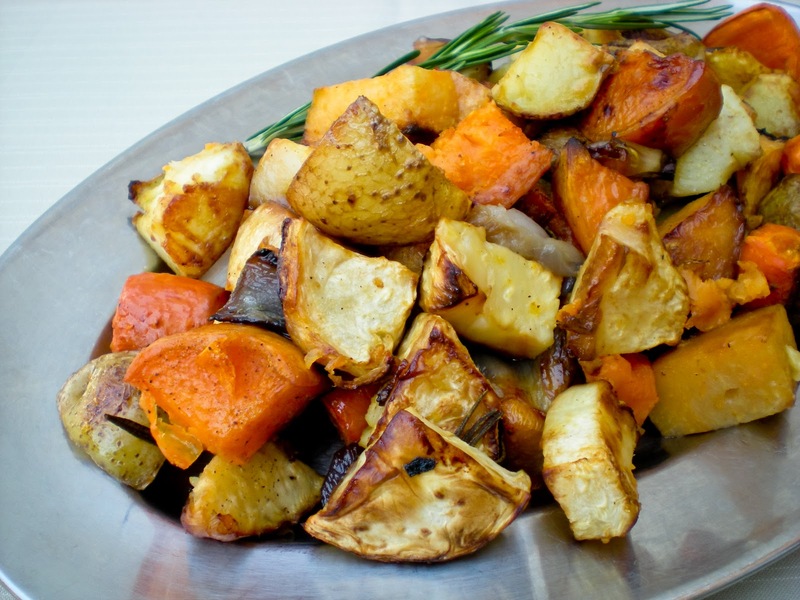 Love roasted vegetables. It's comforting and so much more flavourful! 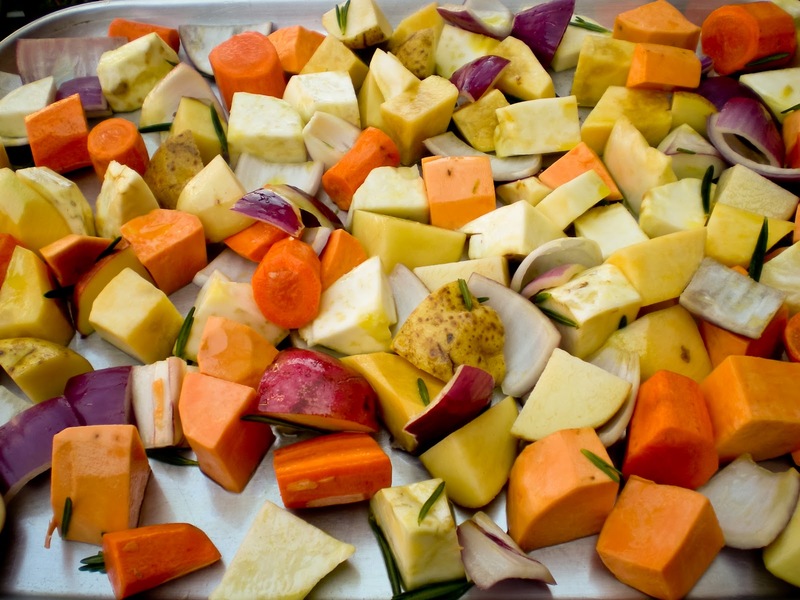 i like to prepared roasted vegetables too, usually during the same time when i roast chicken..Your look good! Roasting veggies is my favorite way to cook them. This dish looks wonderful! Perfect and healthy, simply looks gorgeous with all you have done it with.